Searching The Web for BIG GAME PORK Chow!! The mission started with a simple email asking about a few ideas for ribs or pork chops for the BIG GAME or your next tailgate? Our crack team of researchers hit the key boards with the speed of an offensive lineman pulling a train in order to find a few recipes from the World Wide Web that are geared towards PORK and your Big Game Football Party! This was tough work, playing with laptops and smart phones while dreaming about football party food. It was touch, but somebody had to do it. In the end we came up with five suggestions for Big Game Dishes featuring Pork that we thought you might enjoy! Look over our quick list of dishes and please feel free to post a few of your own or share your favorite Super recipe! Ok, you caught us. Shameless Recipe Promotion! This recipe is one of Kent’s that was used in his recipe cookbook for Pabst Blue Ribbon. It’s quick, easy, full of flavor and don’t have to smoke these fall off the bone beauties for hours on end. Sure, we know they are not smoked for hours on end! We figured you would want to be awake for the game instead of worn out from smoking ribs all night. The great thing is that you can also check out The Deck Chef’s Pabst Blue Ribbon Barbecue sauce as well. You can use it with all kinds of grilled or smoked meats, crock pot barbecue pork, grilled ribs and those little tiny hot dogs and meatballs that are staples at many football parties and tailgates. Did we say ribs? 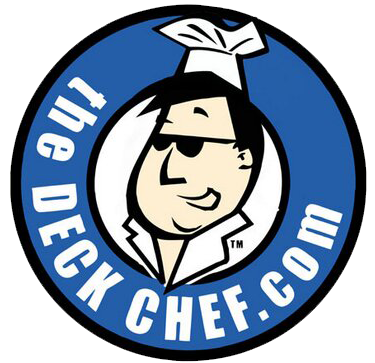 Check out The Deck Chef’s gas grill wood chip rib recipe that he used on the CSS Network Tailgate Show. Come to think of it… download the Pabst Blue Ribbon Cookbook by Kent Whitaker FREE right here! We stepped out of the box with this one. We thought a nice kabob recipe would be a good addition to any tailgate party. The great thing about kabobs is that you can swap out and add extras as you see fit. If you don’t like green peppers, the slide on some of your favorite items and start grilling. Or, cook these tasty pork kabobs in the oven. It’s your choice. 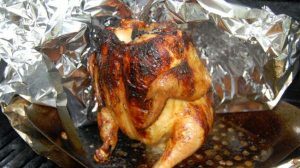 This recipe comes from a great website dedicated to healthy cooking from the Cancer Council of Victoria and was originally published in the book Lifetrack (1999), Eat! Enjoy! The Lifetrack cookbook of Melbourne. Yes, we know the football there is a tad bit different from that played here in the states by NFL teams but recipes cross many boundaries. Photo and recipe from the Cancer Council of Victoria and the Better Health Channel. 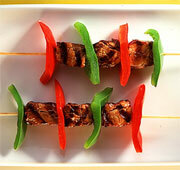 Check out the Sweet Chilli Ginger Pork Kabob Recipe Here. It’s a Slider coming in at Number Three! 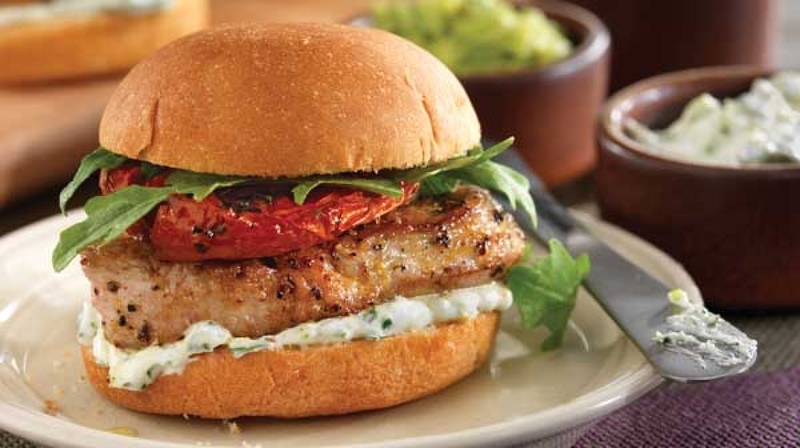 These pork tenderloin sliders are packed with flavor from the pork and the sauce! You really can’t beat the tasty combination when it comes to sliders. 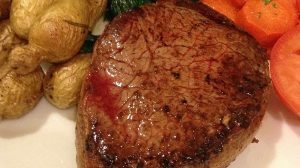 Take a few minutes to read over the recipe to get your tenderloin going and then you have some time to knock out the other steps. Serve these handfuls of tailgate love to your party guests and you will be as popular as a field goal kicker knocking one through to win the game with no time left on the clock. We can’t promise you will be carried around on people shoulders… but we can’t rule it out. Picture and Recipe from the National Pork Board. 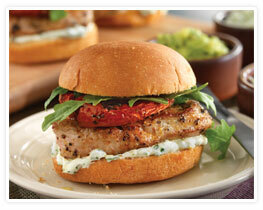 Check out the Pork Tenderloin Slider Here! Cobb Salad Ham Roll Up! We went for simple on number two! 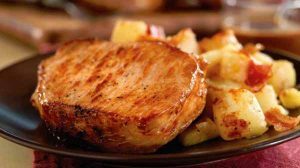 Pork – Be Inspired! That’s what we were thinking. We needed an inspired version of a meat roll up that would make for a great finger food. The combination of Ham, Mayo, Mustard and a few other simple ingredients. Forget those old meat roll ups with a slice of ham and fake cheese. These babies score a touchdown and pull off the two point conversion by nailing things that are high on our list. That’s Flavor, ease and cost. You can make a whole bunch of these tasty roll ups for a pretty low price. In addition, you can make them, cover, chill and pull them out of the fridge when you are ready to go. Picture and Recipe from the National Pork Board. 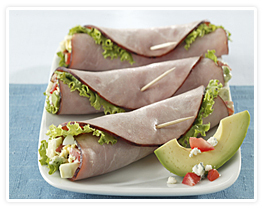 Check out the Cobb Salad Ham Roll Up Here! Chip Walter is the voice for FOOTBALL in Middle Tennessee. The Voice of the MTSU Blue Raiders and Learfield Sports told me that this Brunswick Stew was “This is the best I’ve ever tasted!” Trust me, Chip knows his BBQ and his Brunswick Stew. Middle Tennessee is a hot bed for great barbecue and with his duties covering Sports across the country, Chip has a chance to sample fine eats from all over. 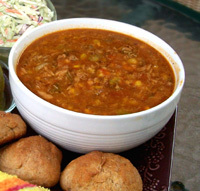 Check out his recipe here which combines pork and several easy to find ingredients for a tasty Brunswick Stew that will make a perfect addition to your Football Party! Check Out Chips Favorite Easy Brunswick Stew Here.